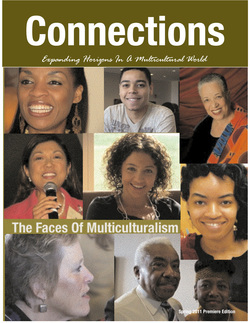 It is with excitement that I introduce the Multicultural Symposium Series' Magazine Debut: Connection: Expanding Horizons In A Multicultural World. Connections is a news and professional development publication targeted at a multicultural audience of professionals, advocates, and emerging leaders who are making a positive impact on a globally diverse world. Our first issue of this specialty magazine will debut in the Summer 2013. The initial print run will be 10,000 - 15,000 copies distributed across New England and the US. We are looking for advertisers, sponsors, and creative writers who can contribute to the success of this new publication. Complete the form below and become a part of the advancement of global diversity, multiculturalism and inclusion with Connections Magazine.